Ikastaro eta Mintegi batzuk aste honetan hasiko dira, beste batzuk hurrengo asteetan... hori dela eta, urtero egiten dugun moduan, gogoratu nahi dizugu izena eman behar duzula. Lana errazteko Mintegi eta Ikastaro guztien koadroa idatzi dugu behean. Izena sakatuz gero inskripzio orrira joango zara. Ez ahaztu datu guztiak bete ondoren "Bidali" botoia sakatzea, bestela ez dugu zuen inskripzioia jasoko. Hala eta guztiz ere, egun batzuk pasa ondoren, begiratu ea zure izena onartuen zerrendetan agertzen den. Duda edo problemaren bat badaukazu, bidal iezaguzu mezu edo iruskin bat. Esta semana comenzarán algunos Cursos y Seminarios, otros en las próximas semanas, por eso, como todos los años, queremos recordarte que debes inscribirte. Para facilitar el trabajo hemos colocado abajo el cuadro de todos los Seminarios y Cursos. Pulsando sobre el nombre, irás a la hoja de inscripción. No olvides pulsar el botón de "Enviar" una vez hayas completado todos los datos, si no no recibiremos tu inscripción. Aún así, pasados unos días, comprueba si tu nombre aparece en el listado de admitidos/as. Si tienes alguna duda o problema, mándanos un mensaje o comentario. 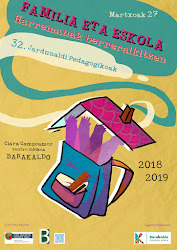 Oraindik falta diren Mintegiak edo Ikastaroak (Jardunaldi Pedagogikoak, adibidez) unean agertuko dira, blog honetan, goialdeko abisu batean. Los Seminarios y Cursos que aún faltan (Jornadas Pedagógicas, por ejemplo) aparecerán en su momento, en este blog, en un aviso en la parte superior. I i never thought about the subject in the way you do, this gives it all a new viewpoint that makes one wonder if there are more in between heaven as well as earth that one would think, thanks for the enter and keep them comming, I will view and read every time for sure! Great post. I was checking constantly this blog and I'm impressed! Extremely useful information specifically the last part :) I care for such information a lot. I was seeking this certain info for a long time. Thank you and best of luck. I do like the way you have presented this matter plus it does indeed supply us some fodder for thought. On the other hand, coming from everything that I have seen, I simply trust when the feed-back stack on that people keep on point and not get started upon a soap box associated with the news du jour. All the same, thank you for this excellent piece and even though I can not necessarily go along with this in totality, I respect your standpoint. Whoa! This blog looks exactly like my old one! It's on a entirely different topic but it has pretty much the same page layout and design. Outstanding choice of colors! I leave a response whenever I like a post on a website or if I have something to contribute to the conversation. Usually it's triggered by the fire communicated in the post I browsed. And after this post Berritzegune B04 Barakaldo » 2011/2012: MINTEGIAK ETA IKASTAROAK. I was moved enough to create a thought :-P I actually do have 2 questions for you if you don't mind. Is it simply me or does it appear like a few of these remarks appear like written by brain dead individuals? :-P And, if you are posting at additional online social sites, I'd like to follow you. Could you list every one of your shared sites like your Facebook page, twitter feed, or linkedin profile? Someone necessarily lend a hand to make seriously posts I'd state. This is the first time I frequented your website page and to this point? I surprised with the analysis you made to create this particular post amazing. Excellent job! I'm really impressed with your writing skills as well as with the layout on your weblog. Is this a paid theme or did you modify it yourself? Either way keep up the nice quality writing, it is rare to see a great blog like this one these days..
Great awesome issues here. Iˇ¦m very glad to peer your article. Thanks a lot and i'm having a look ahead to contact you. Will you kindly drop me a mail? Appreciate the particular democratic tactic nevertheless any definitive reply should be open sooner or later. Even now some crucial walking obstructs have been established in to position. I like the helpful info you provide in your articles. I will bookmark your blog and check again here frequently. I'm quite certain I will learn plenty of new stuff right here! Good luck for the next! i see what your mean. You've got noted extremely intriguing details ! ps decent web web site . I got what you intend, regards for posting .Woh I am pleased to find this website through google. "Delay is preferable to error." by Thomas Jefferson. Very interesting topic , thankyou for putting up. "Not by age but by capacity is wisdom acquired." by Titus Maccius Plautus. Good – I should certainly pronounce, impressed with your web site. I had no trouble navigating through all tabs as well as related info ended up being truly easy to do to access. I recently found what I hoped for before you know it in the least. Quite unusual. Is likely to appreciate it for those who add forums or anything, web site theme . a tones way for your customer to communicate. Nice task. Thanks, I've just been searching for information about this subject for a long time and yours is the best I have found out till now. But, what in regards to the bottom line? Are you sure about the source? I've recently started a site, the information you offer on this site has helped me greatly. Thank you for all of your time & work. Great – I should definitely pronounce, impressed with your site. I had no trouble navigating through all tabs as well as related information ended up being truly simple to do to access. I recently found what I hoped for before you know it in the least. Quite unusual. Is likely to appreciate it for those who add forums or something, website theme . a tones way for your customer to communicate. Nice task.. I am not very good with English but I line up this rattling easy to read.